Behavior change is hard. We’re creatures of habit so creating new habits, like journaling, can be a challenge because we’re introducing a change in thought patterns and behaviors. When it comes to change we have a tendency to make a long list of what we want to begin (or stop) doing and that list quickly becomes overwhelming and is a recipe for a failed attempt. More effective than microscopically analyzing yourself and creating a list of all that you would like to do (or stop doing) is nailing down a “keystone” habit, which can carry over and help lock your other habits in place. Take exercise as an example. Lets say you start exercising consistently once a week, and unknowingly you begin eating better and being more productive at work. She feels less stressed and have increased motivation toward your goals. The ingrained patterns in your brain reform. By starting with exercising once a week you created a habit and the overall affects of that habit carried over into other aspects of your life. You acquire one habit and everything in your life can change. Keystone habits spark a chain reaction of other good habits and can rapidly alter every aspect of your life. Like exercise, journaling is also one of those habits with far reaching benefits. Journaling as a keystone habit can help you find your purpose, heal yourself, and create the life you most desire. It is a way of coaching yourself through your “stuff” and letting it out on the page, unclogging your mind from years of destructive thoughts. In doing so, begin to see life with unsurpassed clarity. writing consistently in a journal can help you re-discover a purpose and significance for your life. The idea of journaling can be daunting and one of the biggest challenges can be what to write. Having pre-written prompts as a guide and inspiration can make it easier to overcome that challenge. Guided journals make journaling more fun and less intimidating especially if you’re just starting out. An inspiring tool for list lovers to discover the keys to their own unique happiness and bring more joy and balance into their lives. This beautiful, undated hardcover journal with 52 listing prompts encourages readers to reflect, acknowledge, and invest in themselves, and ultimately transform their lives by figuring out exactly what makes them happy. Create 52 lists, one for every week of the year, that will help you discover the beauty, joy, creativity, and power you already have! This gorgeous undated journal of weekly lists will help nurture self-expression and self-development. A portable sacred sanctuary to record our flashes of insight, find our ground, create and clarify our goals, and bear witness to our own evolution. More than 150 beautiful pages of questions, teachings, inspiring imagery, and plenty of space to write, draw, and reflect, this journaling adventure guides us into nine compelling portals to our highest ways of living. A 52 week guide to cultivate an attitude of gratitude! It is a self exploration journal designed to focus on being thankful for what we have, the big things in life, as well as the simple joys. Each well designed weekly spread contains an inspirational quote, space to write 3 things you are thankful for each day of the week, and a weekly checkpoint. If you start each day by writing down three things you are thankful for – a good cup of coffee, the smell of rain, starting a good book – you begin each day on the right note. Do it daily and make it a habit to focus on the blessings you have been given! A quick, daily meditation practice that shows readers how to turn old emotional wounds and unhealthy beliefs into wisdom and clarity. The simple exercises in this journal guide you step-by-step into establishing healthy self-esteem, self-trust, and self-respect. Cultivating an attitude of gratitude yields many benefits: physical, mental and spiritual. In this Journal, you have flexibility to write down the dates of entry and not feel guilty if you miss a day. There are also pages in this journal where you can just draw something beautiful. Every page contains an inspirational quote. Gratitude is a feeling of appreciation for what one has. Write down three to five things you are grateful for in this journal and turn your ordinary moments into blessings. Start From Where You Are An interactive journal designed to help readers nurture their creativity, mindfulness, and self-motivation. It helps readers navigate the confusion and chaos of daily life with a simple reminder: that by taking the time to know ourselves and what those dreams are, we can appreciate the world around us and achieve our dreams. A beautiful, full-color guided journal that readers can use to help them appreciate the beauty of the present moment and “live in the now.” With insightful questions, inspiring quotations, and thoughtful meditations, this journal is a guide to mindfulness for anyone who spends too much time thinking about the past and/or worrying about the future. 365 unique, actionable writing prompts divided into 52 weekly mindfulness topics. This gives you seven days to fully immerse yourself in each topic. Also the prompts are unique enough so you’ll never feel bored while journaling. These prompts are fun, engaging, and will help you gain an appreciation for the world around you. Explore your inner world and be inspired with The Wellbeing Journal. Developed in partnership with Mind, the mental health charity, each page of this gorgeous journal has been thoughtfully crafted. It includes activities, coloring, drawing prompts, contemplative quotes, and lots of space for you to write about your own thoughts, feelings, and experiences. Creativity and reflection can have a powerful, positive influence on our lives. A thoughtful interactive book that gently guides readers to reflect on their emotions, intentions, and energy. Through a series of simple, practical prompts and playful illustrated exercises, The Mindful Life Journal: Seven Minutes a Day for a Better, More Meaningful Life will help you feel better in the morning, be more productive during the day, and sleep better at night. With just seven minutes of effort per day, you’ll begin to knock down the barriers between you and a happier life. A beautifully-crafted guided journal book that will inspire you to the core. This journal is filled with 365 lists, writing prompts and questions that will help you reconnect with your inner self, write your heart out, and get your creative juices flowing. I started my journaling practice with 52 Lists for Happiness. Almost 2 years later, I don’t always use guided journals, but when I do, [right now] I’m using Practice You: A Journal and The Joy of Now. Very nice and informative post, I use to keep a journal and to be since it was awesome and i was much more organized then. Have always wanted to start again but i have a lot of thing going on at the same time. I haven’t written in a journal since I was a teenager. I need to check out these books to help me to get some ideas. I love that these are all guided. Journaling with a purpose. I always have the hardest time with keeping a journal. Its hard to be consistent so I only write when I’m really emotional and then when I go back and read it later I feel ridiculous. So a guided journal is a great idea! I need to start journaling. I am planning to join a small group in my church, and our homework includes some spiritual journaling. I would also like to journal my thoughts of the day and what I learned, so I remember years from now, how I was doing and what I still need to do to improve myself. I love these. I’ve been journaling forever but these books really lend themselves to great focus and are so pretty. Those are some great recommendations! Journaling is a really good habit, especially on the not-so-good days. It helps you gather your thoughts, be positive and look back with content. What a great idea for those who want to start their career in journaling. and thanks for sharing these journal formats. Thanks for the great ideas. I love journaling but need to remember to be consistent. I haven’t journaled in such a long time. Thanks for the recommendations and different journaling formats! This is very nice and helpful information, it will help many readers thank you for sharing with us. I love journaling. It actually helps me keep sane despite all the stress and destruction. Will check these ones out since I am almost out of pages to write on. Thank you for sharing about this. I love the idea of writing in a journal. But I’ve always found the habit hard to keep. I love all of these journals and the fact that they each have a theme.. I think the fact that they offer inspiration is so helpful. I think the Guided journal might be the one for me. I always start and then quite a week into it. The guided may help! Thanks for the great recommendations and different journaling formats! It is so hard to get into the habit! These all look and sounds so great! I used to journal a lot but I’ve lost patience with it. These journals are definitely inspiring though, I might have to pick it back up! These look like such great ideas! I love the ones that don’t have dates where you don’t feel guilty for missing one. Such a great resource here. So many great benefits to putting your thoughts on paper. I need to look for a few of these inspirational journals! This is fantastic! I used to journal a lot but in a traditional one. 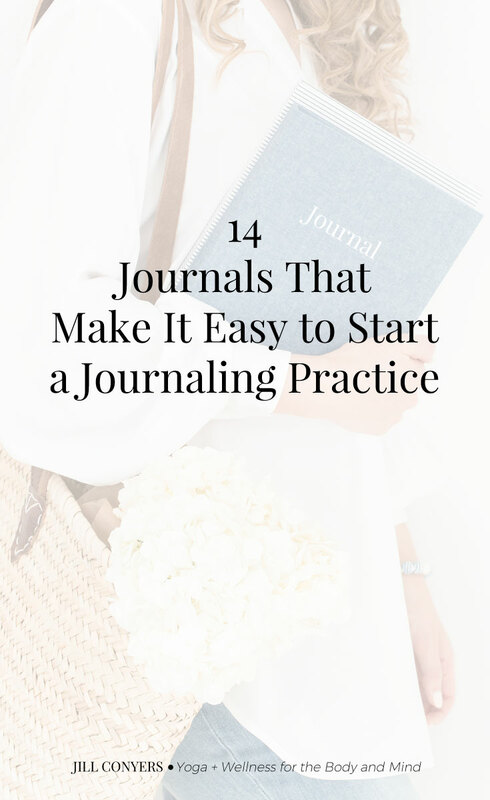 I really love the idea of a guided journal though — it’s super helpful for those who are just starting out and it gives some guidance on where to begin! Since I started my blog, it’s really taken over my journaling life, but I could so be tempted to get back into it with one of these! Great post! I habe the first 52 LIsts book as well as Start Where You Are and I loved using them both. I filled them up but still open them from time to time. I haven’t journaled in a while. I’ll have to buy one of these! I love this post!!!! I love your Benefits to Journaling list and your journal recommendations!! !